How do you get people’s attention during holiday season? Talk about movies! Most people love movies. So do I. 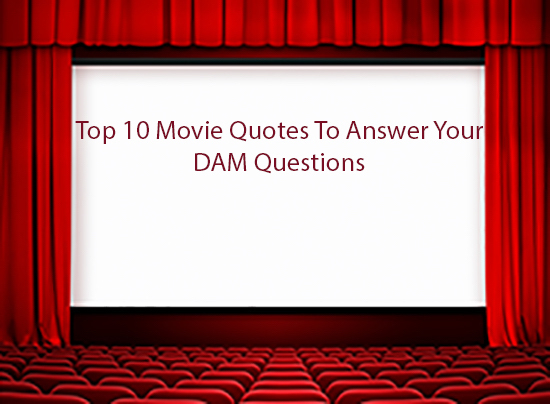 Here are 10 classic movie lines that can sum up answers to most common DAM questions. Enjoy! Having trouble locating assets? Wasting time recreating already created assets? Some of the most common problems we hear from people that have started thinking about a digital asset management solution. Can’t find it, can’t use it. DAM provides a centralized location for all your digital media, making it easy to access, organise and share the right asset at the right time. You think DAM might help. But you don’t want to invest in a DAM system just yet. All your digital media spread out across hard drives, personal computers, storage devices, and different file storage platforms? The reality is – you should invest in a DAM sooner rather than later to stay competitive in today’s fast-paced digital world. DAM saves you time and improves efficiency on many levels. It keeps your brand secure and on-point. Assets taking over your storage systems? Is your cloud-storage, such as DropBox, enough for your organisation? It might be. But when is a time you need to move on from a simple cloud-storage solution? Cloud file storage is a common business practice these days, however the search capabilities are limited, there is no version control or digital rights management. It might be sufficient for a small team, for an outside creative agency that mostly creates new assets instead of reusing existing assets, an agency that doesn’t have internal teams that are interested in those already existing assets. The benefits of using a more capable system, like a DAM, would be to make your marketing team more productive and efficient, to make your brand stronger and brand message more consistent, more collaborative and competitive in today’s market place. Now – you’ve decided you need a Digital Asset Management solution. What’s next? How do you want to deploy your DAM solution? Do you require an on-premise solution? Or can a cloud (SaaS) solution meet your needs? What size storage do you require? Get your stakeholders involved and create a list of requirements a DAM should meet. Compare apples to apples. And let us help you in this decision process*. Do we need a dedicated Digital Asset Manager? So your organisation got a DAM solution, it is implemented and ready go. You think you can do it. A Digital Asset Manager role is a complex role that requires a lot of expertise. Your DAM needs an expert to manage it, to deal with any issues, someone who has knowledge and understanding of metadata, digital assets and analytics. Digital asset manager will make sure your system is correctly integrated with your organisation’s other platforms and systems. A DAM professional will help ensure the success of your solution. Many factors influence the success of a DAM solution – choosing the right solution for your organisation, leadership buy-in, user adoption, and other factors. A successful DAM solution amplifies productivity, increases the value of your digital assets, brand, and your organisation. Now – are there any DAM questions? *DataBasics has more than 20 years in DAM industry and has the largest team involved directly in DAM implementations in the region. We are here to answer your questions and help you choose the right solution for your organisation.